Underreamed piles are used in espansive soil. These pile are researched by RORKEE CBRI (central building research institute in INDIA). 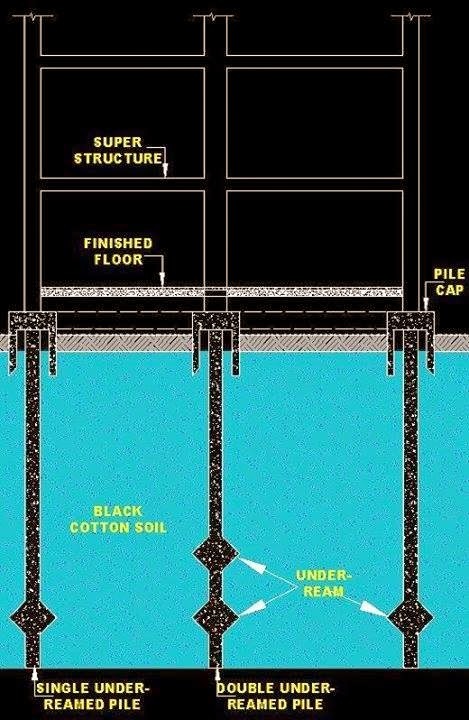 These type of pile transfer the building load at a depth through the pile beyond the seasonal zone variation in moisture content. Depth is kept about 3.65 meter for black cotten soil. Under reamed pile are bored cast in situ piles and have a base like bulb. These piles are connected by the plinth beam at the top. plinth beam is a reinforced concrete beam. Reinforced is also provided in the uunderreamed pile to absorb the tensile forces which are developed during the swelling of soil and these forces are commonly called uplift force. The other big advantage of providing reinforcemnt in underreamed pile is that during the hot weather soil shrinks and pile acts as column.